Kanji Payar is a Rice with curry dish. Kanji is pronounced 'Kun-yee' and is a gruel of rice. Again the use of leftover rice is best for making kanji as it provides a subtle sourness to the dish. It was traditionally a poor mans dish. In later years it became used as a dish for energy. Kanji-vellam (kanji water) is to a Keralite what Barley water or Lucozade is in the west when sick. Its plain taste and richness of starch in addition to the high water content makes it ideal to cleanse the system whilst providing energy. 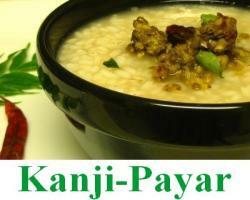 Kanji is most commonly eaten with payar (moong -dal curry), although it can also be eaten with any curry. Another traditional way of eating Kanji is with pickle. Add two parts water to one part rice and boil in a pan until rice softens. Add salt to taste. Kanji is ready when rice is soft and when you fish a grain of rice out and press finger firmly against it, it mashes. The mixture should also look a little milky. There should be plenty of water left in the pan with the rice. Drain moong dal. Set aside. Chop onion. Heat oil in saucepan. Add mustard seeds and cover with lid of pan. Wait for mustard seeds to splutter, add the onion and curry leaves. Stir until sauted. Add the tumeric and green chilli. Stir for a minute. Add the moong dal and add salt to taste. Cover the pan with the lid and leave to cook for about 3 minutes. Add some hot water to the pan (enough to just cover the moong dal) and cook for a further 10 minutes. Uncover the pan and check the moong dal gives under gentle but firm pressure when pressed between thumb and finger. Ensure the remaining water evaporates off, and the moong dal is left dry but cooked. Add 2 tblspns of fresh grated coconut after adding the onions.